I have to admit I was shocked how much I liked this soup. 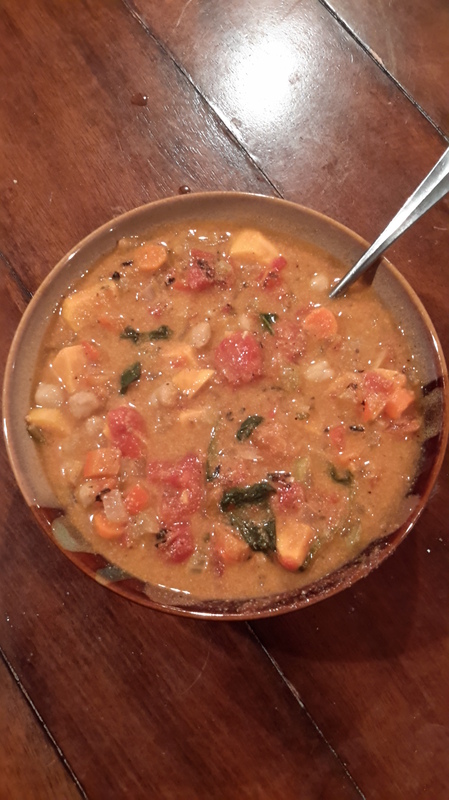 When I first saw it at Oh She Glows I was skeptical about its claim that the soup would have a “creamy” consistency, especially knowing I would needed to revise parts for eating it WFPB, and I wasn’t convinced it would taste very good. But, I wanted to try it and I thought the pictures looked good, so I made it on a whim for dinner about a week ago. And again last night. And I made a larger batch so I could have even more leftovers than I did last time. When I hear a soup is “creamy” I always imagine it must have a clam-chowder-like consistency. This recipe isn’t anywhere near that thick, but it is thicker than only using vegetable broth/stock as a base. The cashew mix adds a slight thickness that I actually notice. 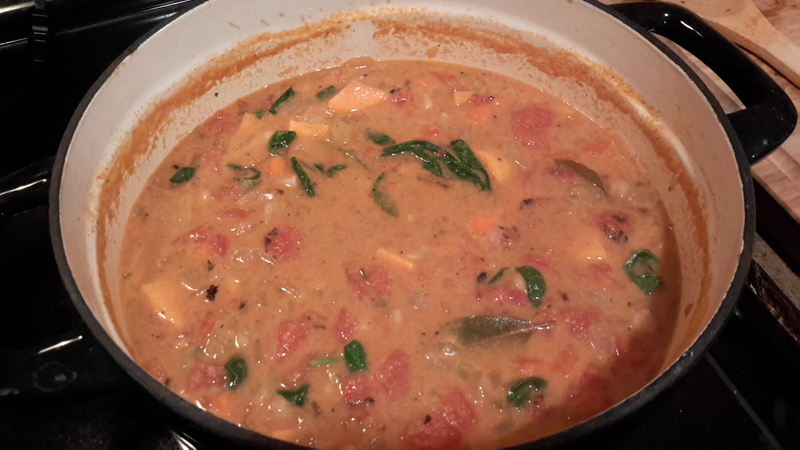 I’ve tried “creamy” WFPB recipes before and they never taste “creamy” to me. 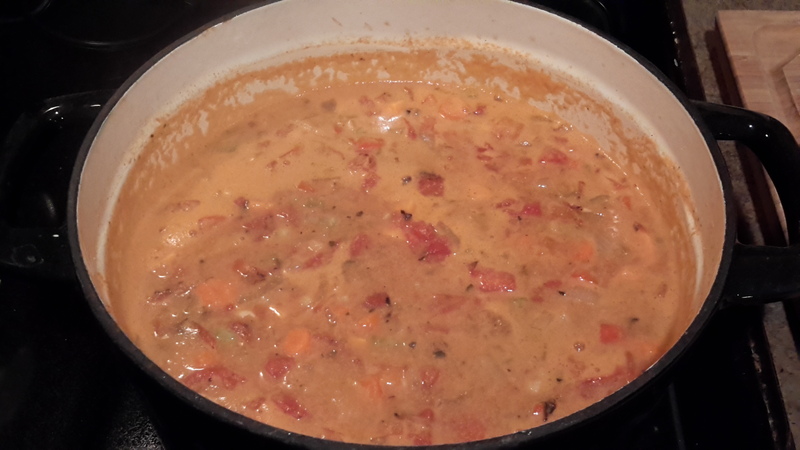 I am happy to vouch for this recipe being a bit thicker than any of the other “creamy” soup recipes I’ve tried so far. It would be better if I had a nicer blender, but it’s still good! This is another one of those recipes where I have to warn you not to be scared off by the length of the ingredient list. None of the ingredients are “weird” or difficult to cut. The only “hard” part is allowing the cashews to soak for 2 hours before making it. The soup is extremely easy to make, and takes less than a half an hour in total to cook. It also freezes very well! (Up to 6 weeks in the freezer, according to the original recipe.) The next time I make this I’m going to try using a Cajun seasoning mix I have. The original recipe recommends trying a cajun or creole mix, and I think both sound very good! If you didn’t soak them already, the first step is to soak the cashews. The water needs to be lukewarm and needs to cover the cashews. Allow them to soak a minimum of two hours. 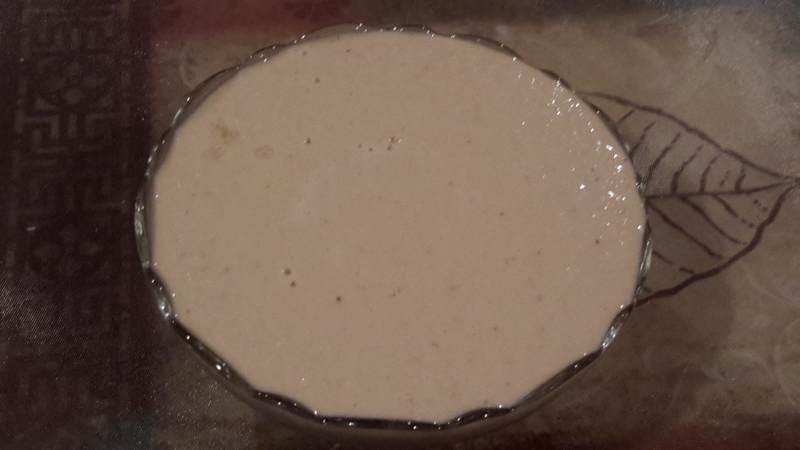 When the cashews are done soaking, drain the excess water and dump the cashews in a blender. Pour in 1 cup of the vegetable broth. Blend until the cashews are as thoroughly mixed with the broth as you can get them. My blender is a cheap thing so it blends pretty well but the end result is not a perfect liquid consistency; I can still see tiny flecks of the cashew. It’s good enough for me. Set aside the cashew mixture. In a large pot (seriously, you’re about to dump a lot of liquid in for this soup, make sure it’s a big pot) over medium heat, sauté the onion and garlic in water (as needed, just a couple tablespoons should be fine) until the onion is translucent, about 3-5 minutes or so. Add in all the veggies, the canned tomatoes and its juice, the last 5 cups of vegetable broth, the cashew cream, and all the spices. Stir it all up. DO NOT add the chickpeas and spinach/kale yet! Bring the soup to a bowl, then reduce the heat to medium-low (leaning towards medium) and allow the soup to simmer for 20 minutes, uncovered. Stir occasionally. In the last 5 minutes of simmering stir in the chickpeas and spinach/kale. Ladle the soup into a bowl and enjoy your amazing creation!